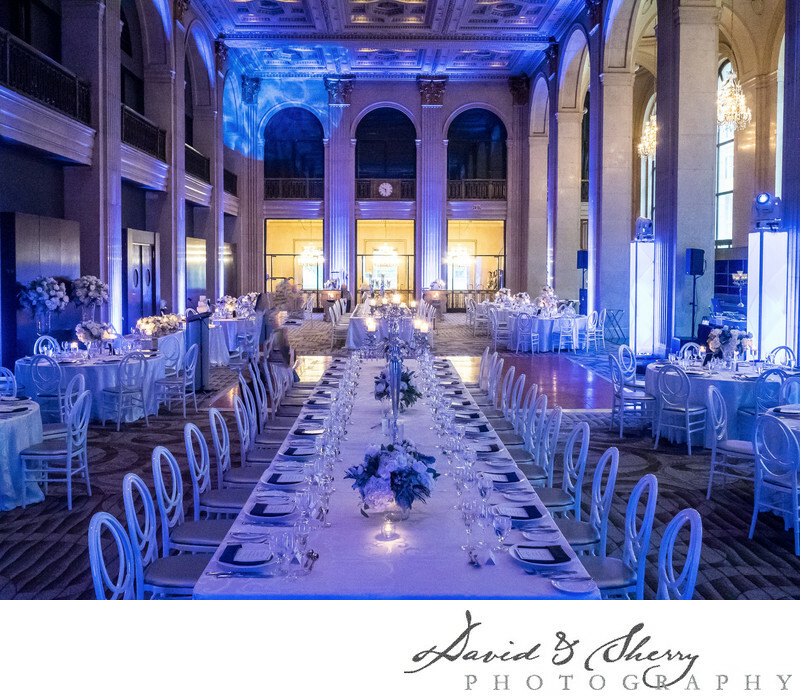 This luxury wedding decor was the statement piece of Jarrod & Jennifer's wedding at One King West in downtown Toronto. Designed and artistically rendered by the wonderful Rachel A Clingen. This swanky affair was the bringing together of hundreds of Toronto's finest to celebrate the union of this fun and loving couple. One King West is a perfect venue for weddings in Toronto. It's bank vault for photos, it's luxury hotel accomodation, it's stately ball room with large ornate pillars and dance floor lit by spotlights creates a setting of luxury and class to weddings held there. This union had been long awaited by family and friends saying they finally tied the knot as they had been together and engaged for quite some time. Surrounded by their 250 guests Jarrod and Jennifer enjoyed their first dance as husband and wife on the spot lit dance floor among the beautiful decor and blue feel of crystals and flowers. This September wedding was filled with wonderful moments throughout the day with dance moves and partying late into the evening. The ceremony site is a double decker room with viewing from the lower level seation as well as the upper level view on the beautiful landscape of the old architecture of the interior of one of downtown Toronto's most historic and beautiful buildings. The details of this wedding were spectacular as you can see by this picture.